As the British weather has yet to go back to its usual miserable state, I've decided it's probably best to make the most of it by going out into the sunshine! Here's what I wore for the day out. 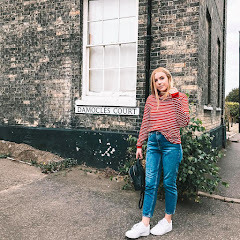 I chose to go for a more casual look starting with my trusty Mom jeans from Topshop, I then paired them with one of my many graphic tees that Topshop have in currently (I love them all). I just love red with dark denim which just asked me to get out my red cross body bag which is a statement within itself. For shoes I wanted to keep it simple, so went for my all white Nike's.